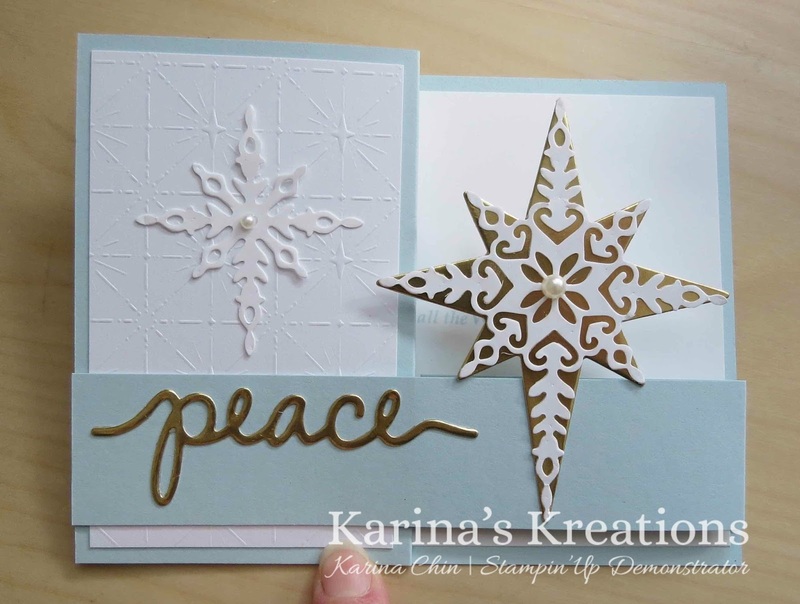 Karina's Kreations: Stampin'Up Star of Light! This cute card was inspired by pinterest. I used Soft Sky, Whisper White and Gold Foil card stock on my card. The stamp set is Star of Light and it has coordinating Star of Light Thinlit Dies. The bundle number is 143508. The cost is $63.75. The white paper is Fancy Frost specialty Designer Series Paper #142186. It's already embossed saving you tons of time. I'm running a special bundles by mail program. 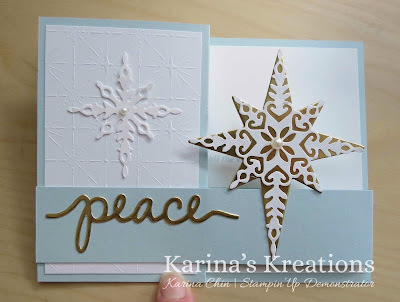 If you love stamping but can’t attend a class check out this fun mail order option. Order 3 bundles for $177.50 plus shipping and Gst and get three hand stamped cards mailed to you in Oct, Nov, and Dec along with the instructions to make the cards. As a special bonus, you will receive 2 embossing folders and more bonus product for a total value of $44.15 free!!! The total cost of Bundles by mail is $205.02. That includes Shipping, Gst and FREE product! Sign up by Sept 30. Contact Karina Chin at kchin2@telus.net.